October 31 is coming soon and with it the deadline for Income Tax Returns for the Self Employed. This time of year is generally very busy for Accountants and the Self Employed as year end returns are prepared and submitted. We have a small computer application that will help in preparing and submitting expense reports and claims. 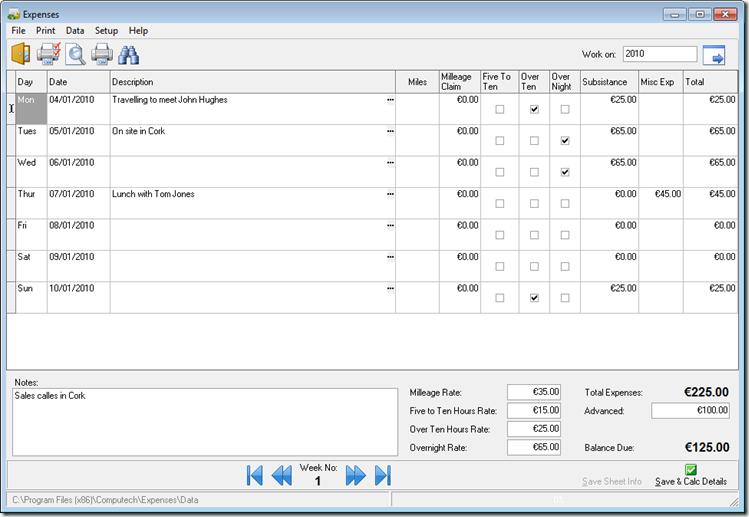 InControl Expenses will allow you to quickly and simply calculate weekly expense reports and print out claim sheets suitable for submitting to your accountant for the preparation of year end accounts. 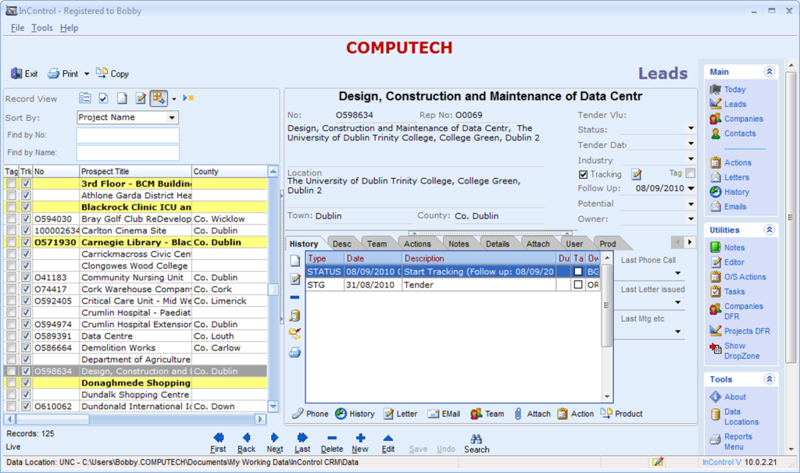 You can download a trial version of the application from our website – www.computech.ie or find more information in our datasheet – click here to download the datasheet. I have tried many different task management apps and I think that I have finally settled on the system that suits my needs. I use a PC and Microsoft Windows as the operating platform but also have an iPhone and iPad, both of which I use constantly during the day. I also implement the GTD methodology for managing the many tasks I have to do. For those of you that do not know what the GTD methodology is I strongly recommend that you read the book – Getting Things Done by David Allen. You can also get a lot more information from the GTDTimes website or on the David Allen website - DavidCo. 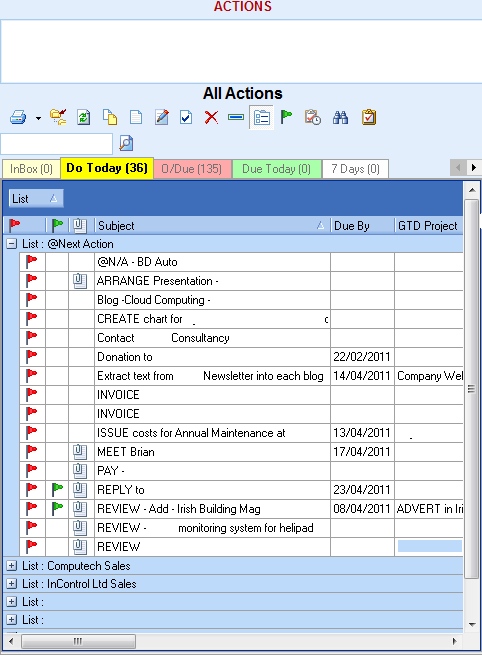 GTD is described as the Art of Stress Free Productivity and is covered very well on Wikipedia – see here for details. Because I am mixing both Apple OS and Microsoft OS in my daily life I needed a solution that allowed me to manage my task list on my PC, iPhone and iPad, keeping them all in sync and also allowing me to clear through my email (managed in Outlook), creating tasks as needed from emails. I encountered many problems and tried many solutions but found it very hard to find a solution that was efficient in managing my tasks, allowing me to add or delete an items on 1 device and the have this item automatically added to or deleted from the other device automatically. I also wanted something that allowed me to access reference materials and attachments etc. when I created an task from an email – one of the main objectives when using GTD is to keep all inboxes empty including the email inbox. 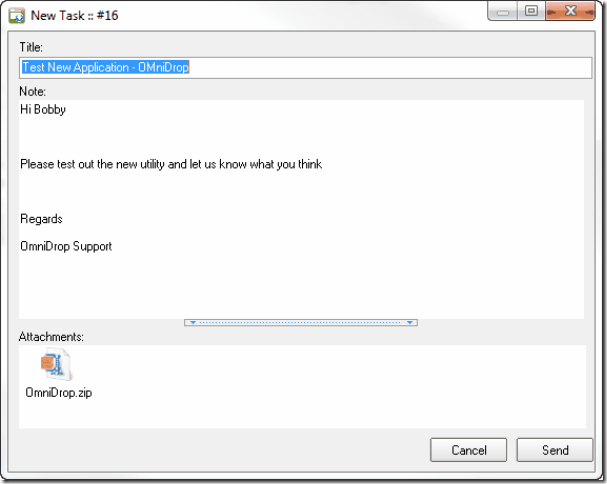 Once a task is created from an email in Outlook and then the email is deleted or archived it is not possible to open any attachment / supporting material when viewing the task on the iPhone or iPad. Omnifocus – Great app with lots of support and a large user community. It would be my preferred choice but unfortunately it is not well integrated with other systems, lacks an import/export function and has no API. Things – Another very good app but also lacks import/export, has no API and synchronisation was not great when I was testing apps. I tried many others – too many to list here and finally settled on a combination of Toodledo and Pocket Informant. 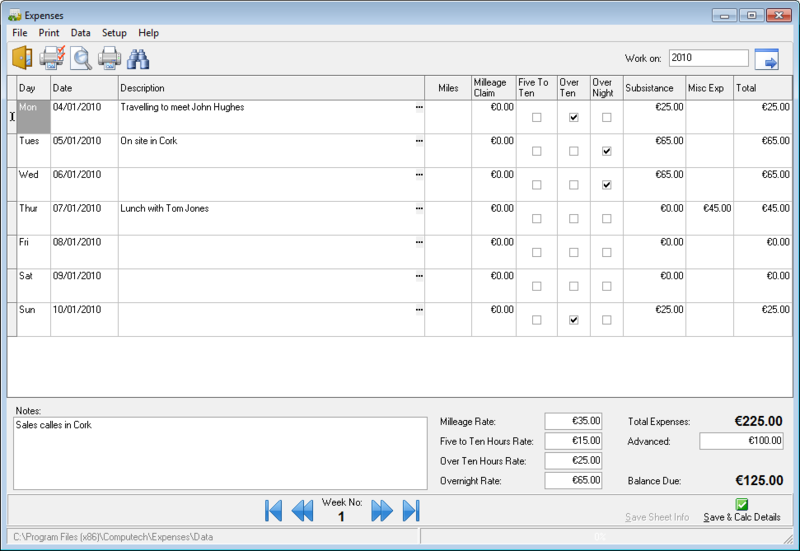 InControl Expenses is a small application designed to help you manage weekly expenses. 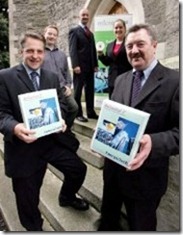 It is primarily designed to work in Ireland but may also be suitable for use in other Countries. A full license for InControl Expenses costs €50. OmniFocus is a a great task management app available for the Apple Mac, iPad and iPhone. 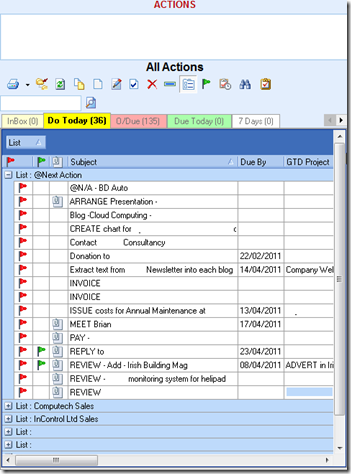 It is specifically designed based on the GTD system. 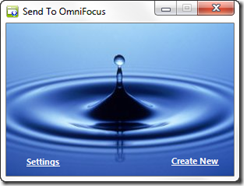 OmniFocus is not available for the Windows platform but can be used independently on an iPad or iPhone. 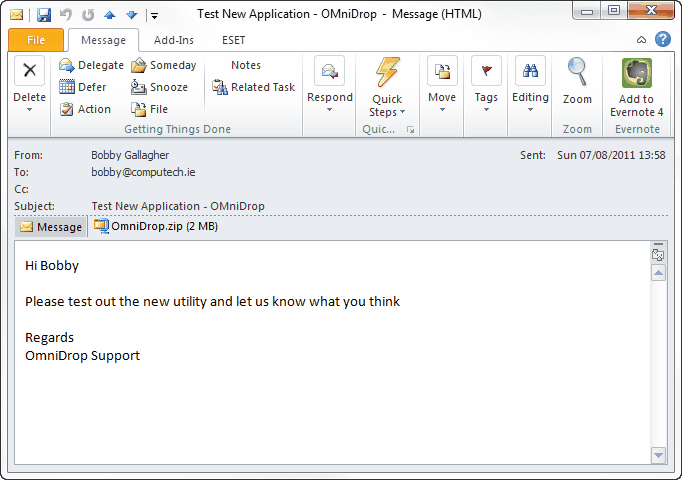 Our utility (not connected to or endorsed by OmniFocus) will allow you to create new tasks from outlook emails or from scratch and also store associated reference material such as email attachments and other files in Dropbox with a reference to the newly created task. 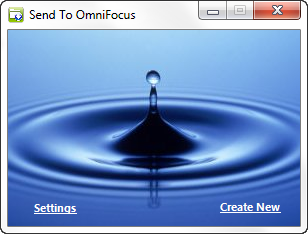 The Settings screen is used to configure the utility. 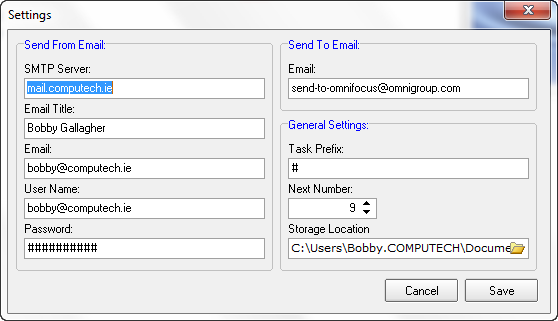 Tasks can be added to Omnifocus by sending an email to a dedicated address – “send-to-omnifocus@omnigroup.com”. The link creates a new task in OmniFocus and uses the Email Subject as the Task Title and the email body as the Task Note. Unfortunately it ignores any attachments which may be needed as reference material for the task. 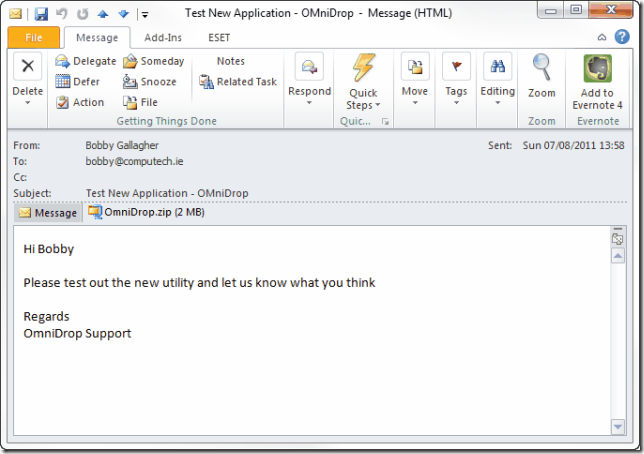 New message is created OmniDrop and the attachment is added to a file list. 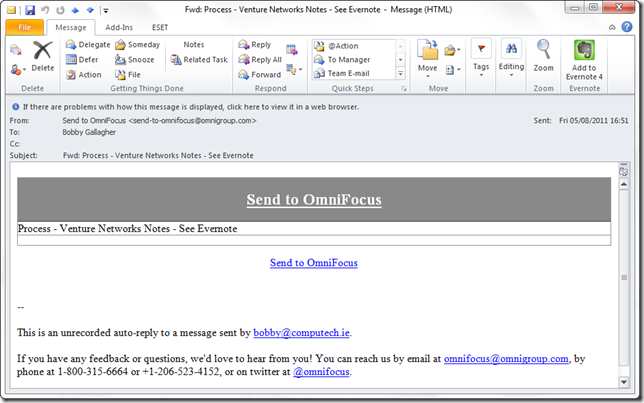 Email is sent to OmniGroup to create the new task and an extra reference is added to the end of the email subject. Attached files are sent to Dropbox and stored in a Dropbox folder using the reference tag added to the end of the email subject. 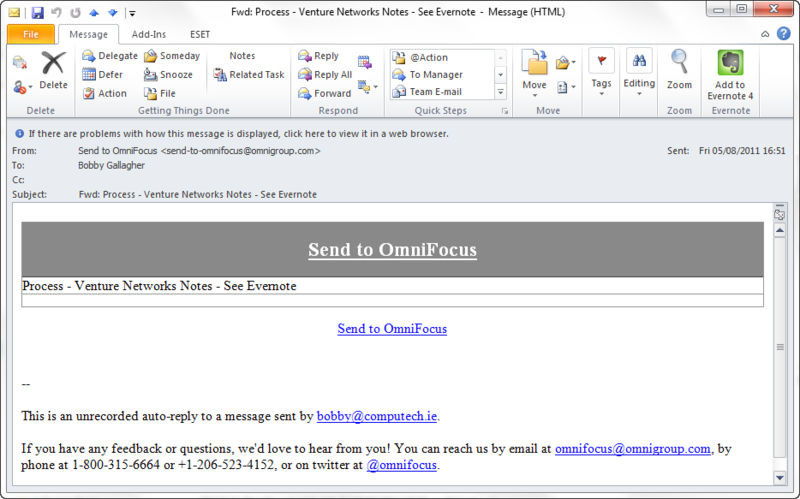 New item is created in OmniDrop with email subject as Title, email body as note and email attachment as attachments. Note also that a new reference number, in this case #16, is created for the item. Copies all attachments to the Dropbox folder. QMS is a Project Management system designed to control and maintain the large volumes of information generated during the construction of any new Commercial or Industrial Project. This is a updated version of IncQA. For further details contact us. IncQA is a Q.A. and Project Management system designed to control and maintain the large volumes of information generated during the construction of any new Commercial or Industrial Project. The system maintains all information in a central repository so that all members of the project team can access both the standard Q.A. System and the project specific information on a daily basis. For further details contact us. 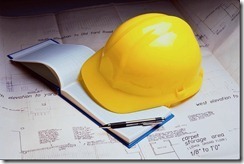 IncHousing is a management tool for private or commercial housing developments. It is designed to give an overview of the development including timescales for house completion, cash flow projections and basic cost management. For further details contact us. Computech, in association with the Commercial Information Company in Belfast, is proud to be the first company to be awarded link-up funding from MicroTrade. MicroTrade is a partnership initiative between InterTradeIreland, Enterprise Northern Ireland and the City & County Enterprise Boards. Further information on MicroTrade can be found at www.microtrade.org. 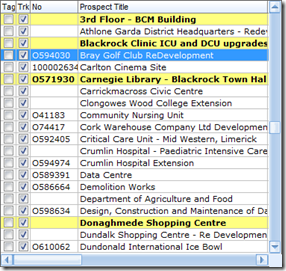 Working closely with Commercial Information Company, Computech have released Version 1 of MailShot. Commercial Information Company – www.cicireland.com launched PlanningIreland at the Building Exhibition 2002, held in the RDS 2nd – 5th Oct. PlanningIreland is a web site, updated daily, with published information on all planning applications in Ireland. 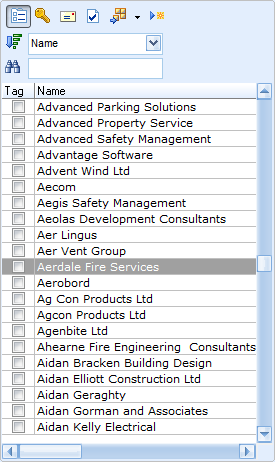 The site currently has information on over 100,000 planning applications. 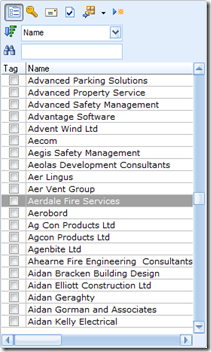 The website is based on planning application information stored by CIC and uses InControl as the database system. 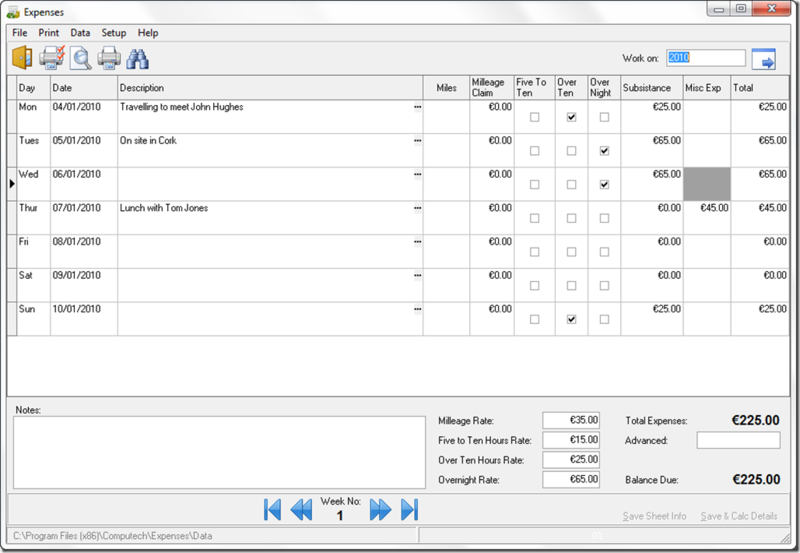 MailShot is a simple to use application designed to leverage the value of the Planning Applications database to act as an effective and flexible sales tool for companies sending mailshots to prospective customers. Trial versions of Mailshot can be downloaded from our Downloads page.